make it perfect: .After THE FEAST. It seems like every sentence I have spoken over the last few weeks started with "when convention is over..."
Now that it is actually over, looks l have no excuses now and a lot of work to do!!! I think I have mentioned this before, but in our church we have callings. The amount of time we serve for varies as do the "jobs" or assignments that we fulfill. 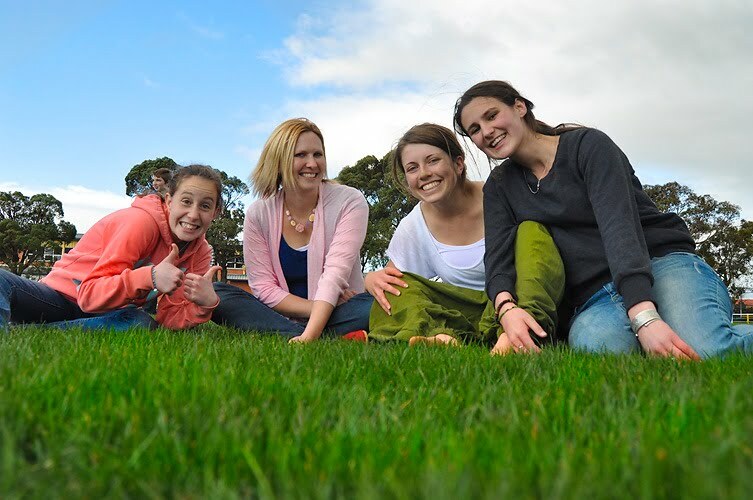 At the moment, I am very blessed to be working with the Young Women (girls aged 12-17). 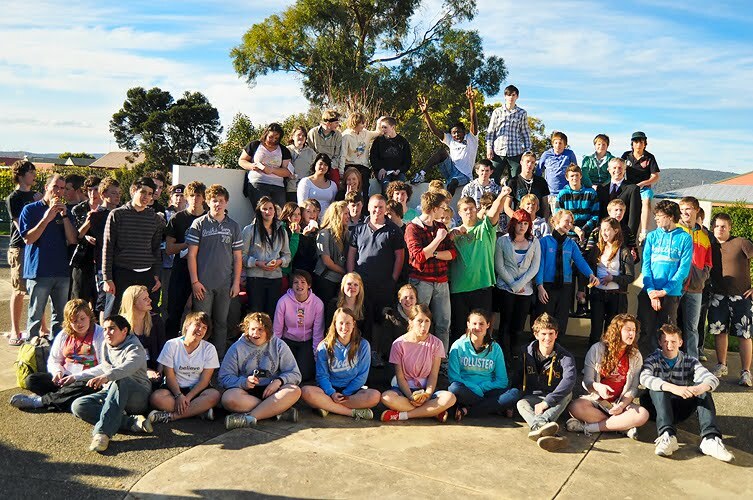 I have just been involved in organising a youth convention - for boys and girls ages between 14-17 in Tasmania. It was a HUGE job, and seemed to consumed my every thought and action over the last month or so but was well worth all of the effort and work that each person in the organising committee put into it. I packed my camera, but it didn't even make it out of my car, so these photos are all stolen from my cousin (and trusty Young Women sidekick) Lisa. She is an awesome "details" blogger, and has written a much more comprehensive post about convention here. I'm not so good with all the details, but I am good at sharing the pretty stuff!!! We were all exhausted by the end of it. I even totally lost my voice and could only whisper for the last day which was not very helpful but did provide a bit of light entertainment and lots of (not) funny jokes! 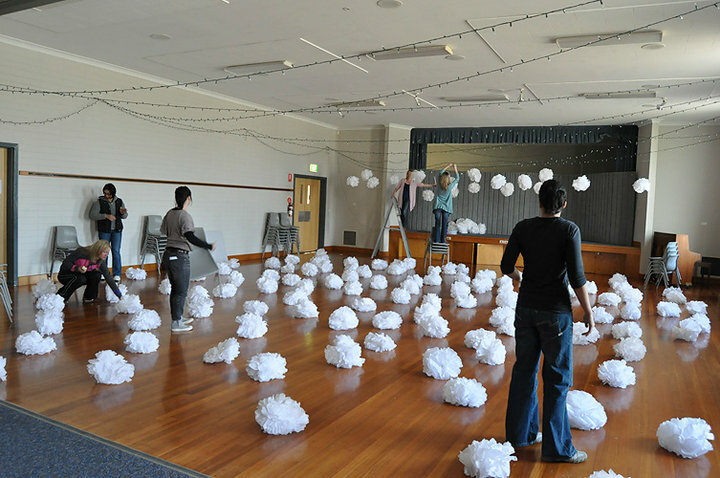 My "baby" was to organise the decorating of the hall for the formal, sit down dinner and grand ball one evening. Of course this kind of thing is right up my alley, but working on a fairly tight budget meant having to be wise with choices and resources. I had doubts about how it was all going to turn out on the night, but couldn't have been more happy with everything in the end. 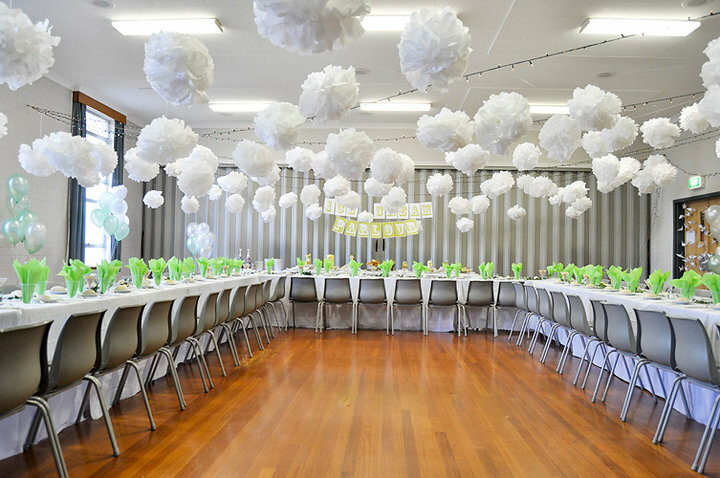 We found white tissue paper at a florist supply shop really cheap and a few girls from church came to my house one night and we folded 150 pom poms following Martha's instructions here. A couple of days before convention, a few more girls met at the chapel to "puff" all of the pom poms. They are very simple to make and look really effective, but when you are making 150 they are also very time consuming!! On the day of the ball, a few of the leaders tied them to the fairy lights and strings of fishing line so that they looked as though they were floating in the air. The colours for the evening were white and green (I couldn't help myself with the green - I love it!!) 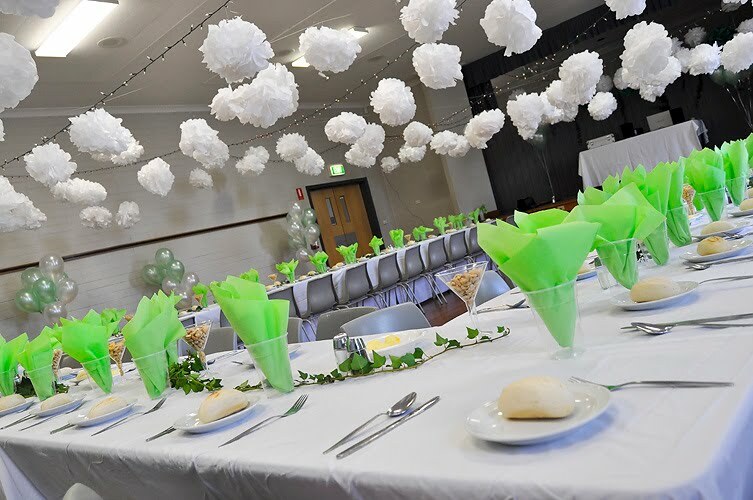 We scattered bunches of helium balloons around the outside of the hall and the tables were set beautifully for the formal dinner. 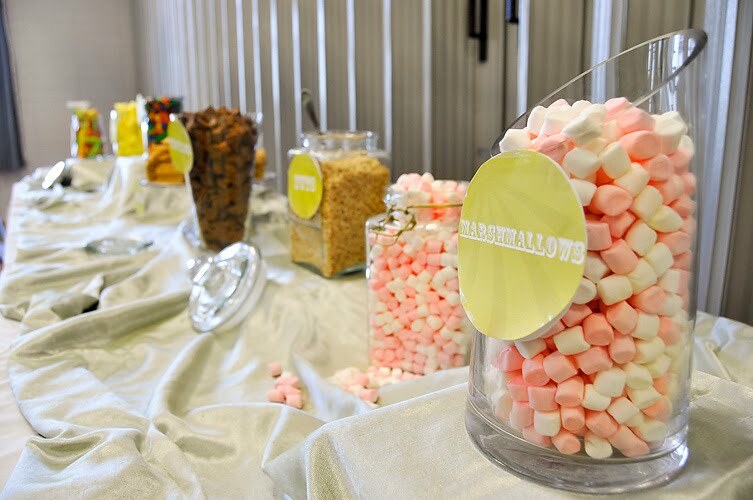 My other "baby" was to put together the dessert bar. 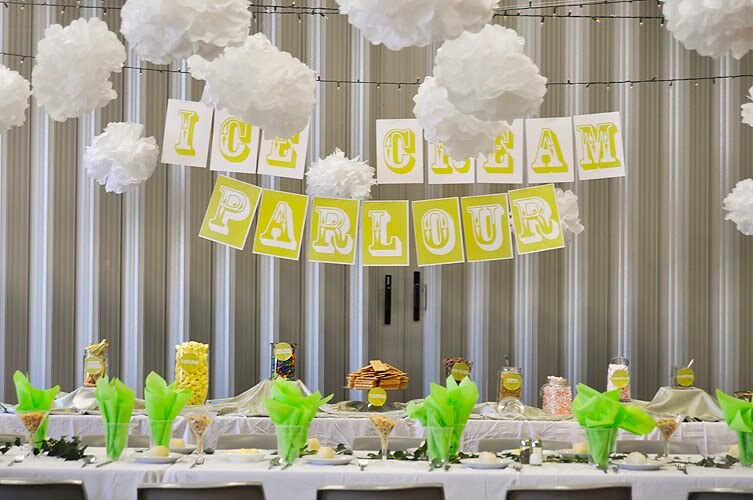 We decided to do something a little different than serving cake or something like that for dessert and made an Ice Cream Parlour with a long dessert bar set up one end of the room, filled with big jars and bowls of lollies and chocolates to sprinkle over bowls of ice cream. 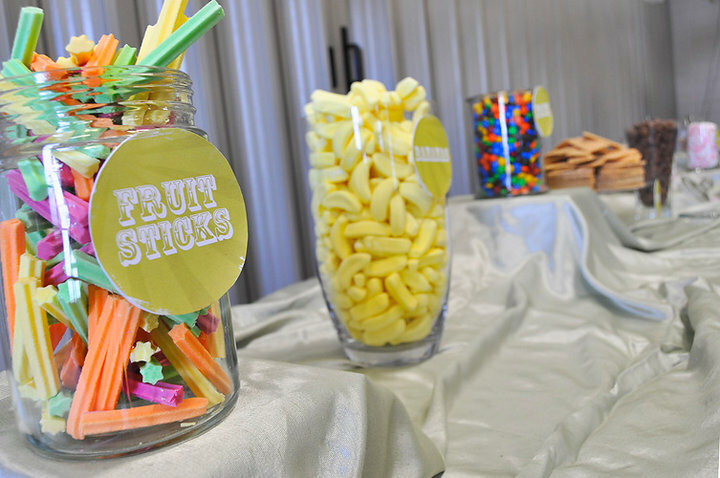 Leanne designed the banner and name tags for each of the jars - they looked great and dessert was a hit! Once dinner was over, the tables and chairs were moved away and the youth danced the night away. 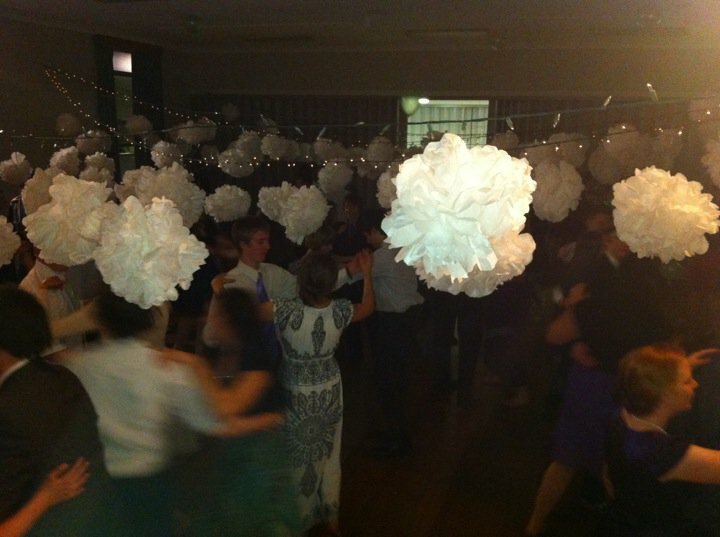 The pom poms were quite low and it looked as though they were dancing in the clouds!! The Hall looks great! You did an amazing job. I would have loved to see it in real life. The desert bar looked great too! Hope it was a great weekend. That looks so fantastic! I love being in YWs - it's awesome. you get paid by having the pleasure of hanging out with me Tone!!!! SOOO glad it's over and so glad it went off well. I'm glad I get to work with you - you are very clever. Heard many great reports from the youth on how much the loved convention! Loved the idea of the ice cream bar yum yum yum! Might have to check out those pom poms on Martha's site they looked great! Wow Toni. It looks so amazing!